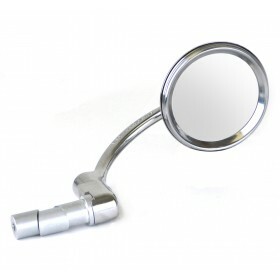 Halcyon's bar end mirror is 100% stainless steel, polished to a mirror finish and has a rectangular head, The arm cranks around to allow your scooter or motorcycle to be parked in tight spaces. The new expanding fitting is suitable for handlebars ranging from 7/8" to 1" in diameter with an inside dimension of between 17.5mm and 21mm. The 3 piece angled tensioner sleeves create a far more secure and re-usable method of fitting. The 820 Halcyon barend mirror was once manufactured by stadium in the UK. Halcyon continued to manufacture the mirror within the UK, there are many replica bar end mirrors on the market, but to our knowledge this mirror is the only one of its kind that is not mass produced overseas. 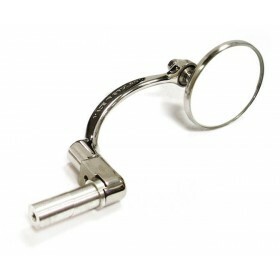 While you may find the other replica bar end mirrors cheaper, when comparing the quality there is a vast difference. 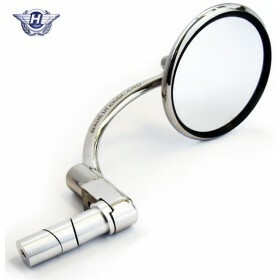 You will not find a better quality Bar end style mirror for your scooter or motorcycle. 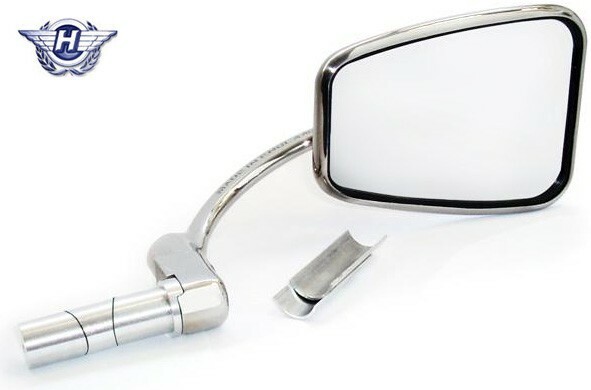 The mirror is 100% Stainless steel to prevent corrosion over time, the curved arm attaches to a knuckle and is tensioned with a spring to allow you to crank the mirror around so that it can be easily repositioned for parking your scooter or motorcycle in tight spaces. The mirror head has a domed screw on the rear and swivels around to allow for fine adjustment . The new expanding fitting is suitable for handlebars ranging from 7/8" to 1" in diameter with an inside dimension of between 17.5mm and 21mm. The 3 piece angled tensioner sleeves create a far more secure and re-usable method of fitting.